Round, gusset bed covered in super soft chenille noodles. 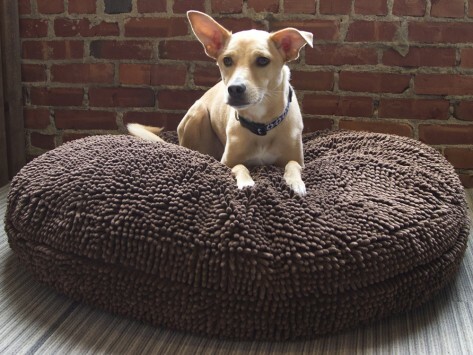 Sizing Information: 24" suitable for dogs up to 25 lbs. ; 36" suitable for dogs up to 70 lbs. ; 42" suitable for dogs up to 110 lbs. My 40 pound blue tick coonhound loves it. The 36 inch is just right. She stepped on the super snoozer and hasn’t left it. Looks beautiful. Easy to clean, no assembly. Dog loves it! As soon as I put the Soggy Doggy bed down, my pup got right on it and loved it. Even sleeps on it now instead of our bed! Keba loves his new nest!